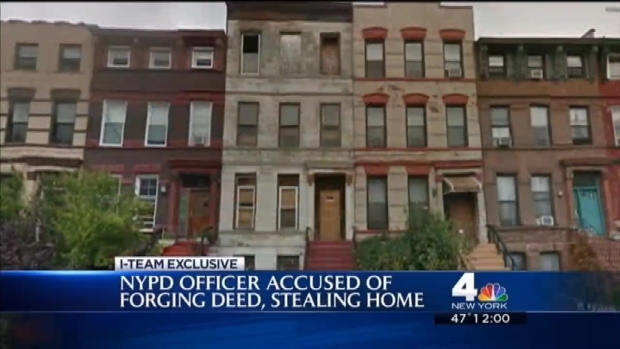 A 45-year-old NYPD officer has been indicted on multiple felony counts, including grand larceny, for allegedly forging a deed to a home in Brooklyn and stealing the property from the rightful owner. Blanche O'Neal, 45, assigned to the 83rd precinct, allegedly submitted a deed in July 2012 indicating she had bought a property on Vernon Avenue for $10,000. The deed said she purchased the property from Colie Gallman, Jr., the sole heir of Lillian Hudson, who had owned the property before she died. About three years later, O'Neal called authorities to report someone had transferred her property to a corporate entity without her permission and alleged she was the victim of deed fraud. O'Neal told detectives she had won a $5,000,000 lawsuits against the estate and was awarded the home as part of a settlement from the person she claimed was the sole heir, Colie Gallman. As part of their investigation into O'Neal's allegation, detectives began looking into the deed transfers on the property going back to the ownership of Lillian Hudson. They determined the deed filed by O'Neal was fraudulent, according to prosecutors. A 45-year-old NYPD officer has been indicted on multiple felony counts, including grand larceny, for allegedly forging a deed to a home in Brooklyn and stealing the property from the rightful owner. Sarah Wallace reports. They also found Colie Gallman was not the sole heir of Lillian Hudson, and that O'Neal had lied several times to detectives in the course of their investigation, authorities say. Neither Gallman nor the other heirs sold or transferred the property to O'Neal, nor were they ever in negotiations to do so, according to prosecutors. In Sept. 2014, O'Neal also falsely testified in an unrelated case to being the owner of the home, prosecutors say. She was indicted on one count of perjury for that alleged offense. For the others, she faces second-degree grand larceny, offering a false instrument for filing and criminal possession of a forged instrument. Information on an attorney for O'Neal wasn't immediately available. She was expected to be arraigned later Monday. The NYPD had no immediate comment on her arrest.